As the Island of Hawaiʻi prepares for the annual Merrie Monarch Festival, the week-long celebration of Hula featuring the acclaimed hula competition, the Volcano Art Center welcomes you to the exhibition On Sacred Ground, an intimate collection of hula images by Dino Morrow.The exhibit opens on Saturday, March 30th at the Volcano Art Center Gallery in Hawai’i Volcanoes National Park. The public is invited to an opening reception with the artist that same evening from 5 to 7pm. 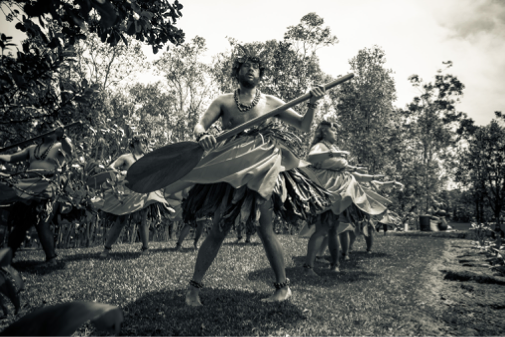 The Volcano Art Center is pleased to have had the contribution of this world class hula and documentary photographer during the 2018Hula Arts At Kilauea Program. 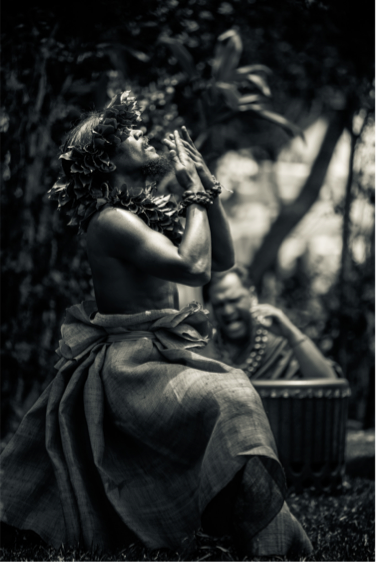 His strong visual aesthetic and attention to detail paired perfectly with the dynamic location in capturing authentic Hula Kahiko performances and other hula related arts. The Hula Arts At Kilauea Program offers the following activities, free of charge, year round: monthly live outdoor Hula Kahiko Performances paired with hands-on cultural demonstrations, weekly Aloha Friday programs which offer short classes on a wide range of hula arts, monthly Hula Voices presentations featuring evening “talk story” sessions with hula practitioners and an annual May Day Celebration. The performances and hands-on activities given by recognized Hawai’i Island resident practitioners provide a greater awareness of the hula arts as a cultural experience and as a way to feel a deep connection to the environment. The non-performance hula activities provide intimate, hands-on, enriching experiences to participants. All VAC Hula Arts Programs help support cultural practitioners in perpetuating the hula arts and in sharing the Aloha Spirit. These ongoing programs allow the Volcano Art Center to continue its long tradition of culturally rich programming. Support from Hawaiʻi Tourism’s Community Enrichment Program allows these programs to be shared with visitors to Hawaiʻi Volcanoes National Park. For a complete schedule of events please visit www.volcanoartcenter.org/hula-arts/or call 808-967-7565. The Volcano Art Center invites you to view the beauty and experience last year’s events by visiting the exhibitionOn Sacred Gound,the photography exhibition will be on display through May 5th.